Over the past few years container adoption has increased rapidly, leaving many to decide what management or orchestration technologies to deploy, how to properly secure data within containerized applications, and what standards to enforce to container provisioning. Many others are still focusing on container adoption best practices! 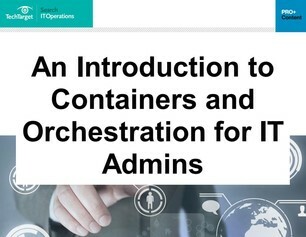 No matter where your organization happens to fall, this new guide from SearchITOperations.com, An Introduction to Containers and Orchestration for IT Admins, has the information you need to ensure you’re able to quickly spin up containers, manage their data, and deploy applications seamlessly. Follow this link to access this new guide while it’s still available.